Despite its proximity to the natural world, Hong Kong has few high-quality green spaces which can temper the frenetic environment of the city. 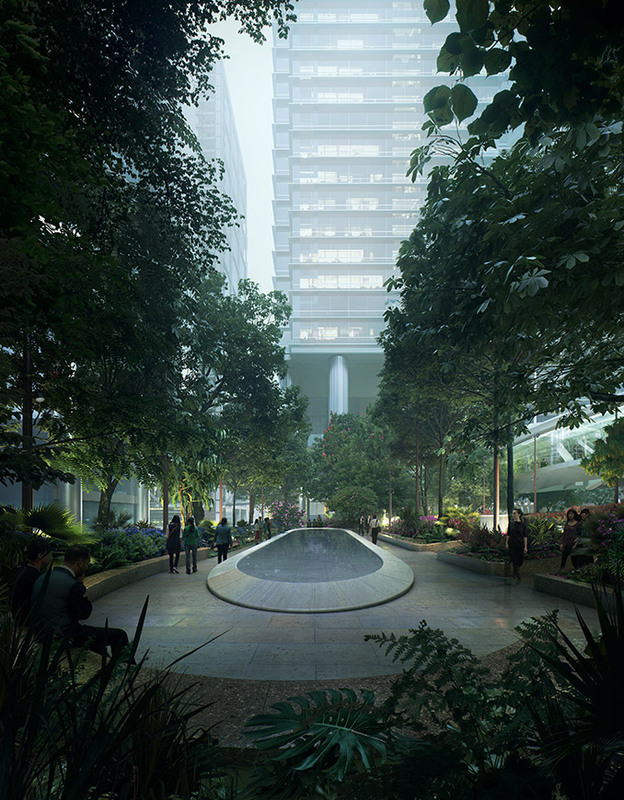 Taikoo Place will create an inclusive open space which includes lush native vegetation and sculptural water features. Its development follows the demolition of two existing towers, signalling the commitment from the developer to create an engaging open space for residents and office workers alike. 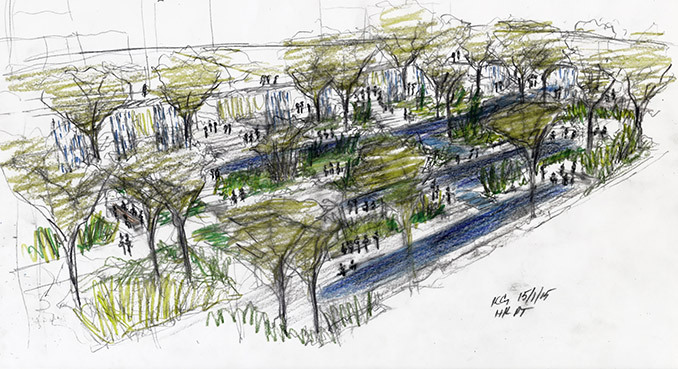 The 69,000sqft landscape project is comprised of a sequence of areas ranging from small intimate places around water to gather with friends and colleagues, to larger open areas suitable for events such as jazz concerts and outdoor markets. 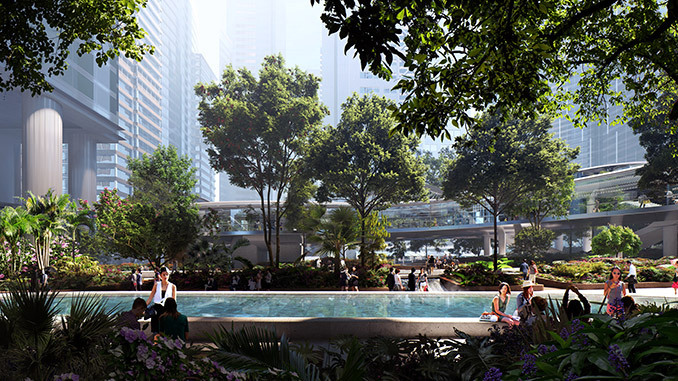 The design for the largest space, Taikoo Square, creates the impression of a series of terraces and is typified by two large longitudinal pools connected by a cascade and a small water table. 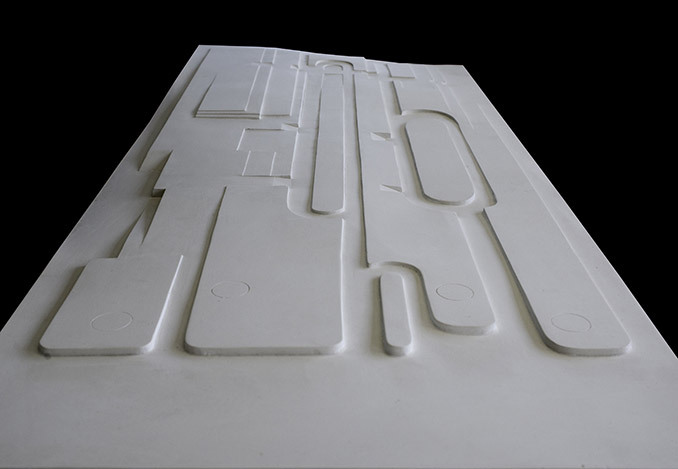 The carving and sculpting of these water features through 3D modelling allows the water to move in exciting ways, bringing movement and pleasant sounds to the square whilst referencing the former Quays that once existed on the site. Densely planted tropical plants framed by sculpted stonework create refined spaces which foster a calm atmosphere. Shade is provided from more than 70 trees which cover the site. To promote biodiversity and raise public awareness of Hong Kong’s heritage of Fung Shui woodlands, 53 of the trees are native species, grown specifically for the project. Fung Shui woodlands are remnants of native woodlands which are protected from agricultural clearances due to their spiritual significance. At Taikoo Place, these remnant species have found a new home and bring additional natural elements to an otherwise dense urban space. 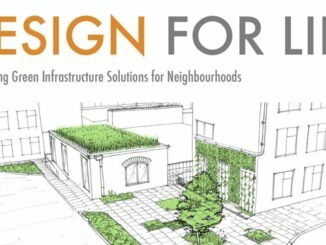 whole solution which greatly enhances the public realm experience for all users. 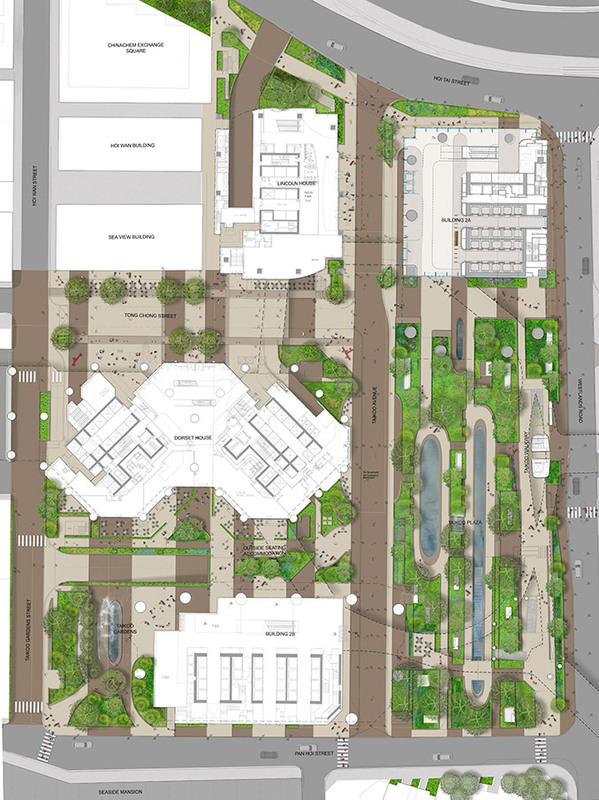 The use of shared surface areas and varied paving textures carry the aesthetics of Taikoo Place into the surrounding streetscape to deliver a continuous design that prioritises pedestrians. 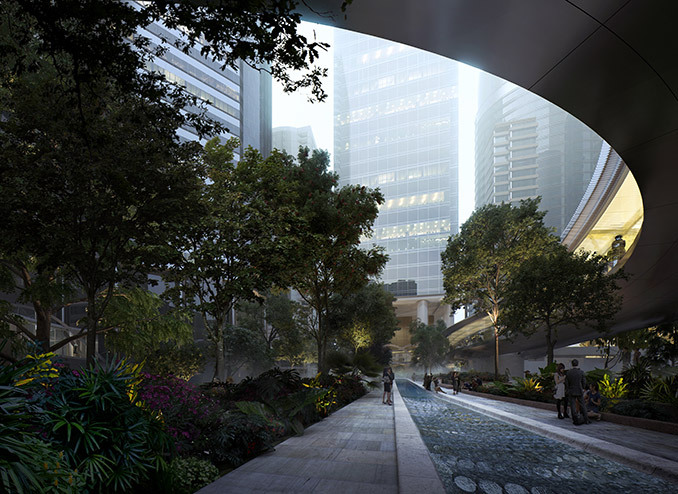 One of Swire Properties’ biggest investments in a decade, the HK$15 billion redevelopment for Taikoo Place greatly enhances the existing site and includes the addition of two Grade-A office towers (designed by Wong Ouyang), and a new elevated walkway designed by Hugh Dutton Associés. The first new tower, One Taikoo Place, is expected to be completed in 2018, followed by the second building, Two Taikoo Place, in 2021. 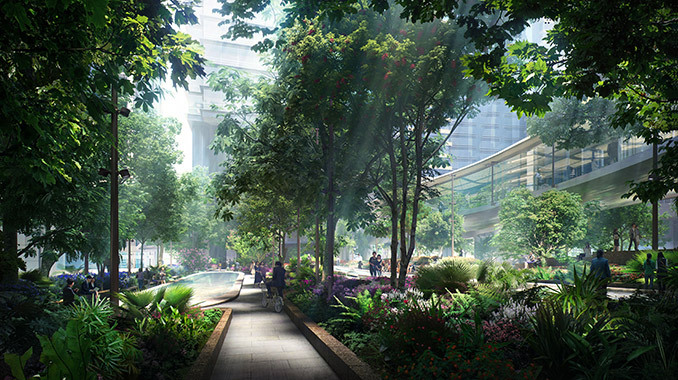 Both office towers will be built to the highest standards of building sustainability, targeting LEED Platinum ratings as advised by Swire Properties’sustainable development team. All floors at One Taikoo Place are designed with large 3-metre-wide curtain wall window panels, offering panoramic views of Victoria Harbour. Full completion is scheduled for 2021. Status | Demolition and basement work started 2015. 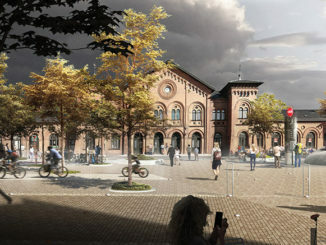 Landscape to start 2020.